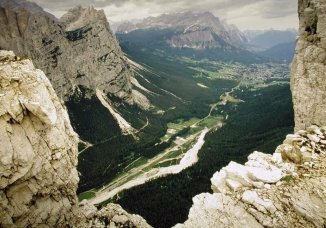 Easily reached by car from Cortina, crossed by a road and a closed aviation runway, sieged by sport and industrial installations, this narrow passage of the Boite valley is squeezed between the last ramparts of the Tofane group and those of the Pomagagnon. The coalition army uneasily collected by Spina-de-Mul moves from the Lastoieres' territory towards the Fanes' highlands, trying to bypass their army through the Boite valley. But the Fanes avoid being deceived and intercept their enemies in the narrows of Fiammes, the only point from where they can cover all access ways into their territory. Here a battle ensues, Dolasilla is wounded, but Ey-de-Net quarrels with the sorcerer and the Fanes gain victory. Excursions: a visit to the Fiammes plain shows nothing specially exciting today. 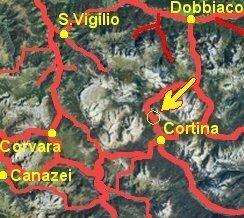 In any case, it is located just out of Cortina, in the direction of Cimabanche pass - Dobbiaco.